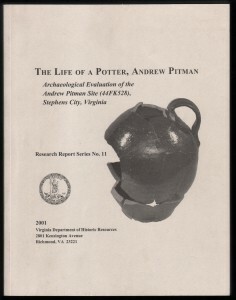 The William and Mary Center for Archaeological Research conducted a thorough analysis of the artifact assemblage recovered by the James River Institute for Archaeology and the Northern Shenandoah Chapter of the Archeological Society of Virginia in 1996. The purpose of this study was to provide a better understanding of the pre-industrial manufacturing activities of a potter, Andrew Pitman, during the last quarter of the eighteenth and first half of the nineteenth centuries. This illustrated volume is a must for collectors and scholars who study early Shenandoah Valley pottery. It contains sixty two pages of text and images as well as artifact inventory and faunal analysis appendices. Copies are available at the Newtown History Center.